As 2012 approaches and we begin to make promises to be the better, kinder, thinner people that we didn’t become after last New Years, I thought it would be a good idea to consider an artwork steeped in snarky wit and revenge. I am obviously not a fan of New Years’ resolutions. James Abbott McNeill Whistler was born in Lowell, Massachusetts, in 1834. The third son of West Point graduate and civil engineer Major George Washington Whistler and his second wife, Anna Matilda McNeill, the young Whistler spent much of his childhood in Russia after his father was charged with the construction of a railroad from St. Petersburg to Moscow. In the family tradition, he enrolled at West Point in 1851, but was dismissed for poor chemistry grades. Determined to be an artist, Whistler packed up his brushes and moved to Europe in 1855, never returning to his native country. After a few years in Paris where he hobnobbed with avant-garde artists like Courbet and Manet, Whistler moved to London in 1859. Whistler’s decision to settle in London had lasting impact on his artistic output. Had he worked in America, he likely would have been affected by Puritanical tendency to imbue art with moral purpose. Had he remained in Paris, he would have been caught up in the burgeoning modernism that inspired artists like Monet, Degas, and Renoir. As it happened, London allowed Whistler to develop his own theory of art, based on the idea that art needs no literary or moral narrative, and should exist solely for its own sake. His was the philosophy of aestheticism, which believed recognized beauty as the only requirement of art. Whistler’s reputation for unusual art and a sassy personality were already well-established when he arrived in London. He was especially well-known for cutting barbs aimed at critics who disliked his work and arrogant remarks about his own talent. “I can’t tell you if genius is hereditary, because heaven has granted me no offspring,” and “I maintain that two and two would continue to make four, in spite of the whine of the amateur for three, or the cry of the critic for five,” are merely two examples of his infamous acerbic wit. Wealthy British shipping magnate Frederick Richards Leyland was one of Whistler’s most important patrons. The Leylands – Frederick and his wife, Frances – were enthusiastic collectors of blue and white Chinese porcelain, and the dining room of their home functioned as a display case for their magnificent collection. 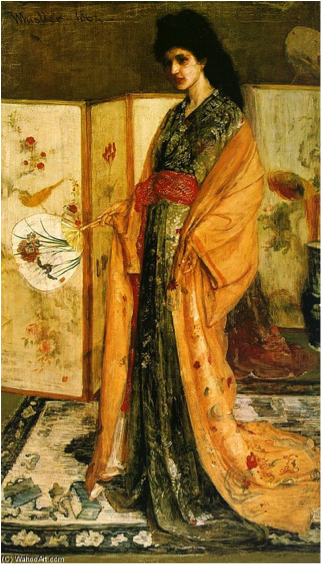 Whistler had even painted a portrait of famed beauty Christina Spartali in fashionable Oriental costume as a centerpiece for the room’s theme. Whistler, Rose and Silver: The Princess from the Land of Porcelain, 1864, oil on canvas. Even with the addition of his painting, Whistler was displeased with the room itself. He felt that the designer’s (famed architect Thomas Jeckyll) emphasis on neutrality and natural light as a foil for the porcelain didn’t celebrate the essence of the exotic objects. In 1876, when Jeckyll fell ill and Leyland was away on business, Whistler proposed modest changes to the décor to his patron, which Leyland approved. 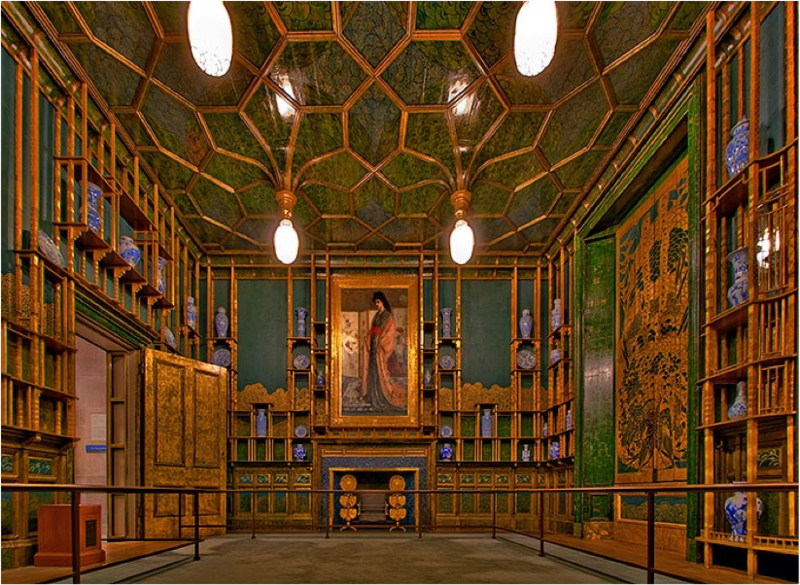 Where Jeckyll envisioned a sunny Chinese pavilion, Whistler wanted to create a stunning, intimate jewel box of a room. The room became a 3D painting, a work of art that you could walk around inside. When Leyland angrily said that he would pay only half of the projected amount, Whistler began another addition to the room’s décor – a mural of two peacocks on the wall facing his Princess. Titled Art and Money or The Story of the Room, two gilded peacocks prepare to fight on a field of Prussian-blue leather (the very fact that Whistler painted the very expensive leather was another slight to Leyland). The peacock on the right has excessively ruffled feathers, Whistler’s homage to the ruffled shirts that Leyland favored. At the feat of this peacock are silver coins – the money that Whistler believed Leyland was selfishly keeping from him. The peacock on the left is crowned by a silver feather; similar to the shock of white hair that Whistler was famous for. Legend tells us that after Whistler completed the work in 1877, Leyland declared that he would have Whistler horsewhipped if he came to the house again. He did, however, keep the room just as Whistler designed it. 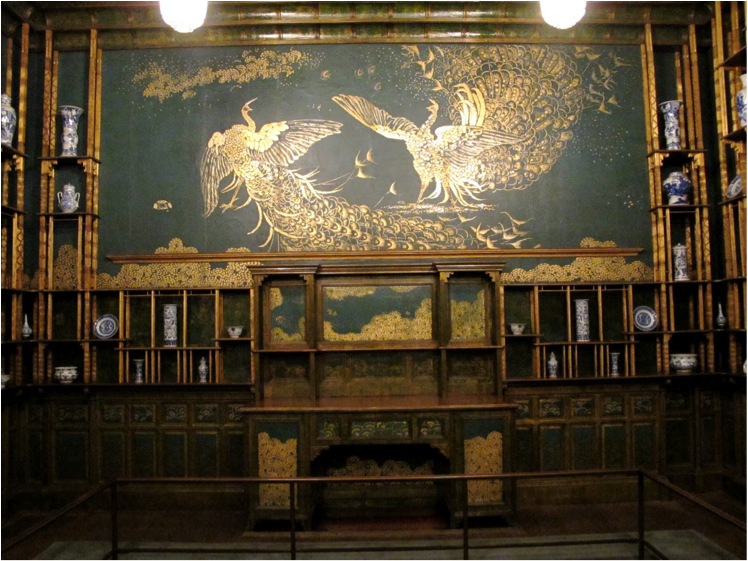 For an artist who once proclaimed, “People will forgive anything but beauty and talent, so I am doubly unpardonable,” Whistler was ultimately pardoned and even vindicated for his design of what came to be known as The Peacock Room. After Leyland died, the room was purchased whole by Charles Lang Freer, an American railroad tycoon, who installed it in the dining room of his Detroit mansion. Thirteen years before his death, Freer bequeathed his entire Whistler collection to the Smithsonian, where the room has remained ever since, one of the most important examples of the aesthetic movement and interior design in the world.